However, had a launch scrub or an error after achieving orbit occurred, the fast track would not have been possible. The former situation occurred during the previous two Russian cargo missions in October 2017 and February 2018 with Progress MS-07 and Progress MS-08 respectively. Indeed, after each scrub—both occurring within a minute of reaching zero in the countdown—the subsequent launch attempt 24 hours later was successful. However, because the precise orbital alignment had passed, the spacecraft had to default to the longer two-day trek. Russian Progress and Soyuz spacecraft have regularly been utilizing a four-orbit, six-hour rendezvous profile since 2012, but even that requires precise alignments. For various reasons, the last time a Russian spacecraft successfully performed a sub-day launch to docking was in September 2017 during Soyuz MS-06. Progress MS-09 pulled into port three hours, 40 minutes after liftoff, which is a record for the ISS program, however it only ranks third in history. In 1966 Gemini 11 rendezvous and docked with an Agena Target Vehicle in one hour, 34 minutes after leaving Florida. In 1967, the Soviet Union launched Kosmos 186 and Kosmos 188 (both uncrewed Soyuz vehicles) on Oct. 27 and 30, respectively, from Baikonur Cosmodrome. The latter launched and docked with the former in just one hour, eight minutes. It was also the first fully automated space docking in history. 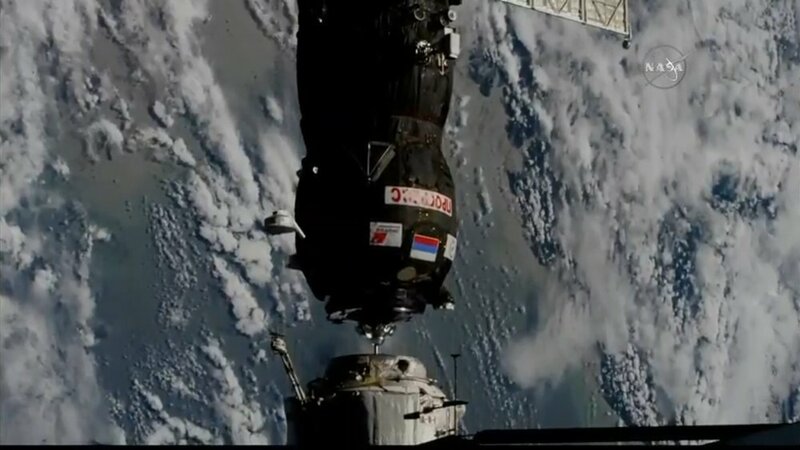 Once Progress MS-09 was within several kilometers of the outpost, the rendezvous and approach to docking went like any other docking. When within several hundred meters, the spacecraft performed a brief flyaround to line up with Pirs. At 7.2 meters long, the freighter slowly guided itself toward its destination, coming into contact with the outpost at a smooth 10 centimeters per second. When the relative motion between the craft and station dampened, the probe retracted to bring Progress the last couple centimeters for the latches to hook and close, forming a hard mate between the two docking surfaces. Progress MS-09 is packed with 2.5 metric tons of supplies. This includes 530 kilograms of propellant, 52 kilograms of oxygen and air, 420 kilograms of water and 1,565 kilograms of dry cargo, according to NASA. It is the fifth uncrewed flight to the 400-metric-ton orbiting outpost in 2018, and the second Progress spacecraft of the year. Overall, it is the 161st Progress since the program began in 1978. In its 40-year history, the freighter design and its various upgrades have serviced four space stations: Salyut 6, Salyut 7, Mir and the ISS. Artemyev and Prokopyev along with the station’s commander—NASA astronaut Drew Feustel—monitored the automated rendezvous and docking. Had an unexpected event occurred, one of the cosmonauts could have remotely taken control of the spacecraft using the station’s TORU system, which serves as a manual backup to the automatic Kurs docking system. Once firmly attached, the two cosmonauts and astronaut began work to check for leaks while the remainder of the Expedition 56 crew—NASA astronauts Ricky Arnold and Serena Aunon-Chancellor, and European Space Agency astronaut Alexander Gerst—were well into their sleep period. This docking continues a busy period for the ISS program. The arrival of Progress MS-09 comes just a week after SpaceX’s CRS-15 Dragon capsule was berthed to the station’s Harmony module. The Progress’s arrival marks only the third time six separate vehicles were docked or berthed to the ISS The previous two times were in 2011 and 2016. Along with Progress MS-06, the current vehicles at ISS also includes Progress MS-08, Soyuz MS-09, Soyuz MS-08, OA-9 Cygnus and CRS-15 Dragon. Cygnus, however, is expected to be unberthed July 15.